Enabling an independent life at home at older age by, at the first phase, solving medication non-adherence problems in home care is Evondos’ mission. 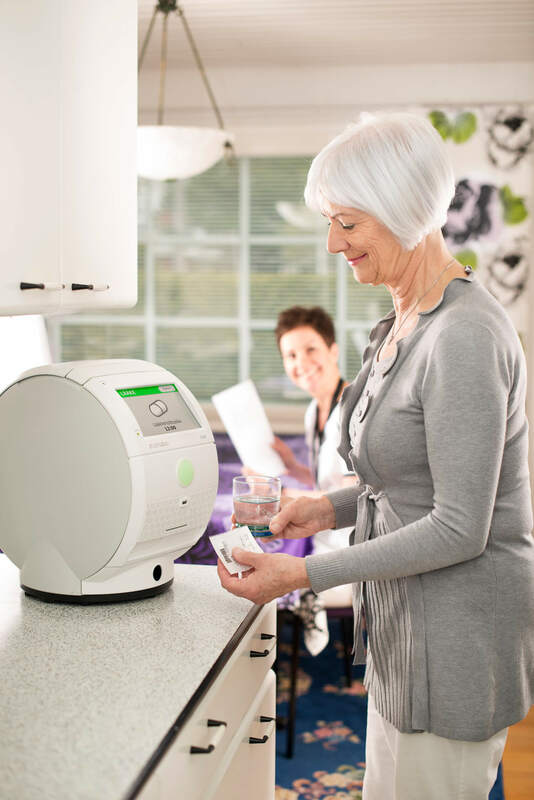 We offer a medicine dispensing robot for professional home care that guides the home care customer into taking the medication as prescribed: the right medication, at right dosage and at the right time. The solution enhances patient safety and lifts medication adherence from the typical success rate of 50% to over 99%. At the same time, drug dispensing errors nearly disappear (less than 0.01%). The easy to use system has an approval rate of 97.7%. The Evondos service also links the care giver organisation, relatives and the client as the dispenser can be used for messaging. Our service also generates significant direct and indirect cost saving possibilities to home care service providers. The Evondos solution helps the elderly to maintain their freedom and autonomy while it helps the care giving organisation to optimise their resources. The first application will be followed by applications in tele diagnostics as well as integrating the service into various ERP solutions. Evondos Ltd headquarters and production are located in Salo, Finland. The company has currently about 60 employees working in Finland, Sweden, Norway and Denmark.